While they take the wind out of Ducati’s PR sails, the pictures confirm plenty of details about the new bike, most importantly that it will be an evolution of the Panigale, rather than a radical new design. It’s the same with its moniker; the Panigale name also gives the bike a handy connection to both the existing Panigale V-twin, which will remain Ducati’s WSBK racer in 2018, and to the smaller 959 Panigale that will be on sale alongside it as Ducati’s junior superbike. This is the ‘S’ version of the bike – it says so on the side – confirming that Ducati is going to stick to its normal model line-up policy. There will also be a base Panigale V4 with lower-spec suspension and eventually a Panigale V4 R with the 1000cc version of the engine to homologate the model for WSBK racing. 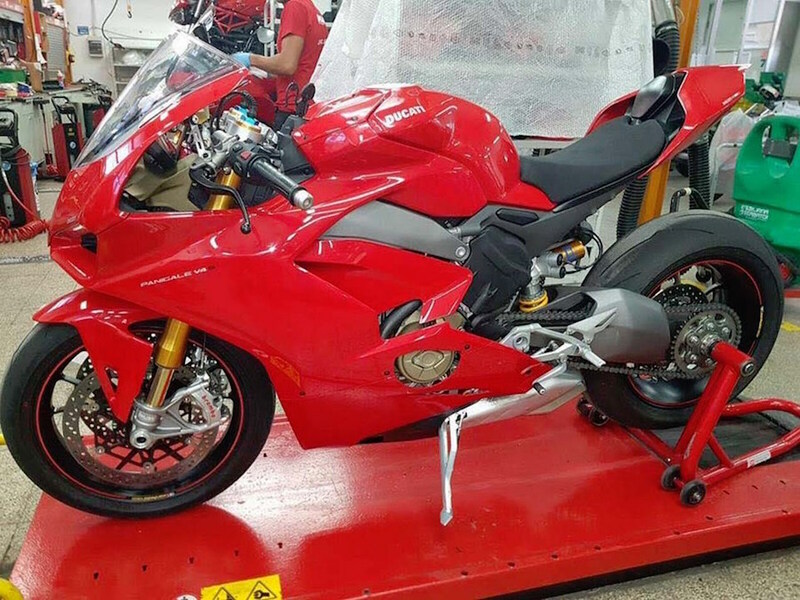 Although this, and all the other Panigale V4s spied so far, is a monoposto version, there are clearly bolt holes for pillion pegs, so a biposto option is going to be offered as well. The semi-dry-sump engine leaves enough space underneath for the entire exhaust, even while meeting tough Euro4 emissions and noise rules, and Ducati has put some effort into the internal aerodynamics as well as the outside – check out the way the outlet ducts on the side panels go under the main bodywork. Frame-wise, the bike appears to have ditched the semi-monocoque chassis for a half-length beam frame. As on the earlier bike, the engine forms most of the structure but the frame doesn’t appear to double as the airbox. The suspension is Öhlins’ semi-active kit; the same stuff that’s already used on the 1299 Panigale S. They look like the same NIX-30 forks and TTX rear shock, although the shock position is more conventional than the V-twin Panigale’s horizontal one. The Brembo brakes are again direct carry-overs from the Panigale. 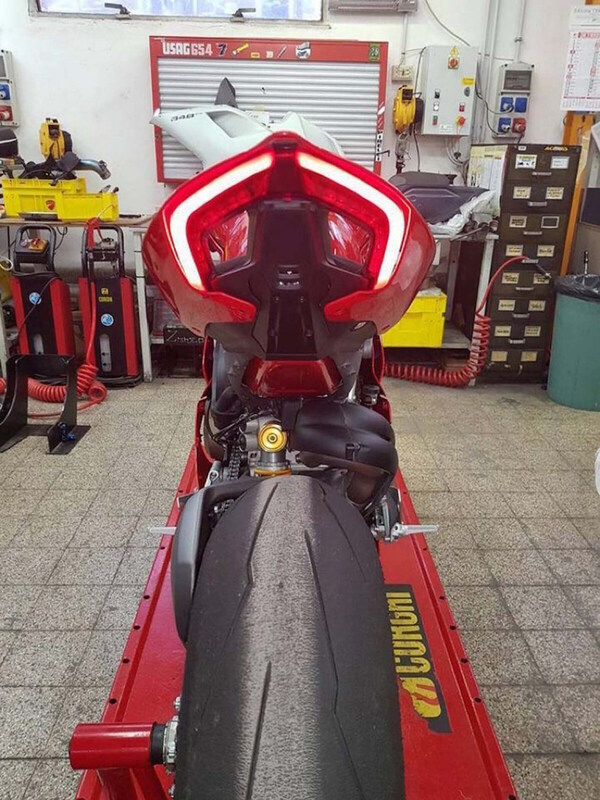 From the back, the bike continues the Panigale’s theme, with tunnels in the tail to funnel the air, but the rear lights are restyled and the tail is even smaller and shorter than before. We wonder how much more Ducati will show us when the bike is officially unveiled in November?